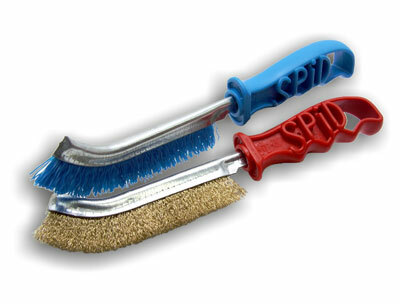 Spid is the universal hand brush, practical, user friendly, resistant designed and licensed by SIT Tecnospazzole over 50 years ago. 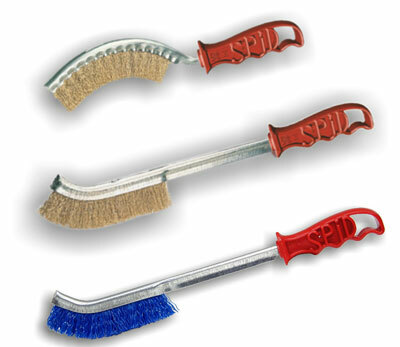 The narrow surface, the special curvature and the ergonomic handle make them uniquely easy to handle. Applications: Ideal to remove rust, paint and dirt from every surface (clean grill after use, scrape off gates, do bike and motorbike maintenance, but also industrial applications!). 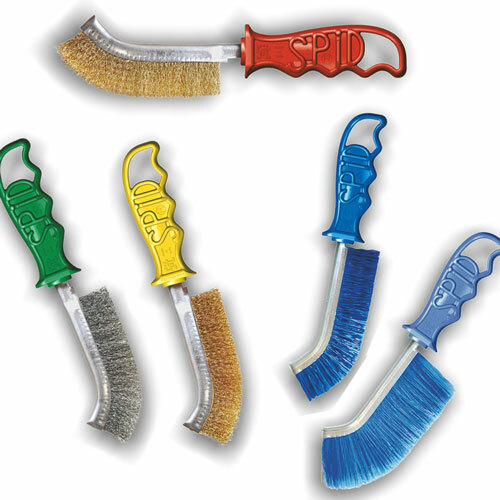 Spid is the universal hand brush, practical, user friendly, resistant designed and licensed by SIT Tecnospazzole over 50 years ago. The narrow surface, the special curvature and the ergonomic handle make them uniquely easy to handle. The shorter filament is stiffer and more robust. Where you need a higher precision in surface brushing. Applications: Ideal to remove rust, paint and dirt from every surface (clean grill after use, scrape off gates, do bike and motorbike maintenance, but also industrial applications!). The designed shape or Long Handle allow to adapt better still to the work surface and to the specific application. The metallic brushes are more aggressive while those with plastic filament are ideal for lighter applications because they don't scratch. Hand Brushes with filament in tempered iron smooth and back in wood. Applications: Jobs on plane surfaces, remove rust, clean weldings and for every other type of scraping off. 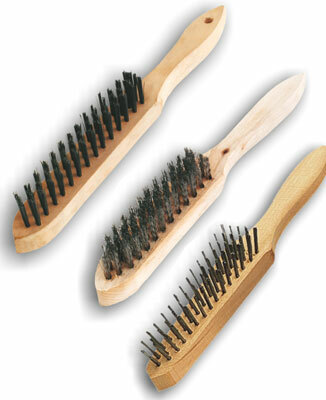 Hand Brushes with filament of tempered iron smooth and back in wood. 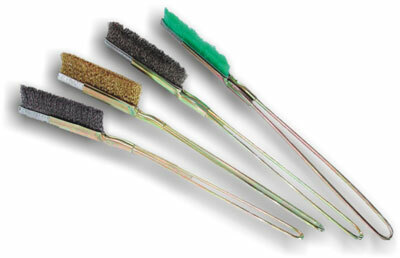 Brushes with plastic handle and stiff filament for numerous applications. 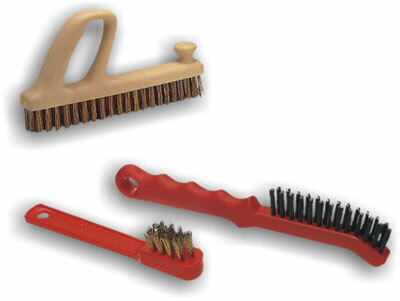 Applications: Planer: with specific handle for heavy-duty jobs on wood and metallic surfaces. Roki: Specific for cleaning brake calipers. 618: Specific for cleaning cars and motorbike spark plugs. 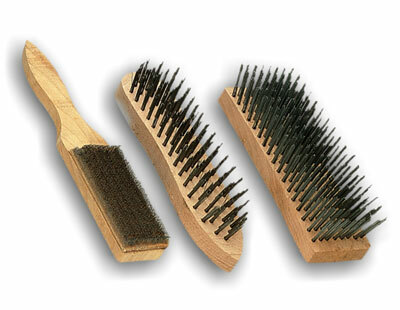 Hand Brushes of limited size for better hand brushing of smaller surfaces and with little cracks dove it would be impossible to intervene with traditional hand brushes. Applications: Removal of rust, paint and dirt from every surface. Depending on the material of the brush and on the application, they are largely used in the restoration in the mechanics, and in several other domestic applications (cleaning between the tiles in the bathroom and in the shower!). - Bevel: for surfaces with corners and edges, it works best "sideways"
- Abrasive Nylon: Various applications depending on the grit on aluminum, steel, cast iron, wood, marble and stones. Use always Individual Protection Devices (IPD like gloves, goggles and ear monitors). Never go beyond the MAX RPM indicated for the brush.